Cryptozoic Entertainment, leading creator of board games, trading cards, and collectibles, and Hobby World, leading Russian publisher of board games, in partnership with WG Labs, today announced the September 6 release of Master of Orion: The Board Game. Based on the classic Master of Orion video game series and utilizing art from 2016’s Master of Orion: Conquer the Stars, the competitive tableau-building game requires 2-4 players to choose from several races (Humans and various alien races), build Systems using their cards, and manage their resources in order to win. Designed by Ekaterina Gorn and Igor Sklyuev, the tabletop game captures the essence of a 4X empire-building video game like Master of Orion in which players "eXplore, eXpand, eXploit, and eXterminate," but streamlines it into an experience that takes an hour or less. The game earned the Seal of Excellence from The Dice Tower, the highly regarded YouTube channel and audio podcast about board games. Cryptozoic recently sold out of the limited pre-release quantities of the game that were made available at this year’s Gen Con. In Master of Orion: The Board Game, each player begins with a board that has four tracks: Food, Fleet, Production, and Morale. The starting numbers on these tracks depend on the race a player chooses, with choices including fan-favorite alien races the Darloks, Psilons, and Meklar. Each round, players gain resources, as indicated on their cards, and a number of actions, as determined by their Exertion Levels. Players spend their action cubes on each turn to manage their resources and build Systems. Since this is a tableau-building game, players use the cards in the deck to build up to four Systems, each comprised of a maximum of five cards that represent various Structures. Victory Points are gained by playing cards, attacking opponents, and having certain resources and cards at the end of the game. The game’s end is triggered in one of three ways: when a player has 0 Morale, a player has five Structure cards in each of their Systems, or eight rounds of play have been completed. There are different paths to victory as players can focus on military means—training spies and attacking alien planets—or the path of creation—controlling the weather and advancing their civilizations. The winner is the player with the most Victory Points, who is deemed the leader of the most developed civilization and therefore appointed as the Emperor at the Galactic Council. 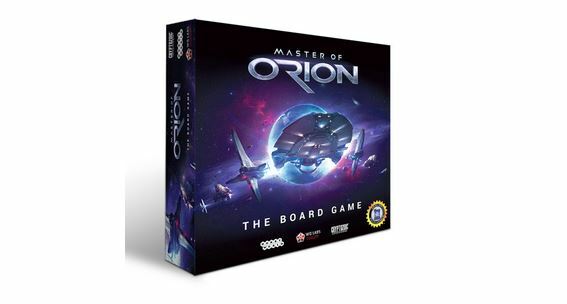 Master of Orion: The Board Game will be available at retailers nationwide September 6 for a suggested retail price of $35.